Now, I’m still waiting to complete my investigation before I charge Britney with “theft.” There is a chance that my Nana just gave Britney a kiss and all her lipstick just smeared onto her. 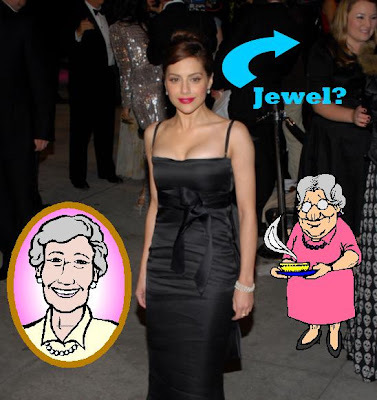 I haven’t seen my Nana in a little while, so she could’ve been at the Vanity Fair Oscar party, you never know. However if I ever run into Britney at a Bingo Hall and I hear her yelling out “B-5?, B-5?” I’m going to know that she is stalking my Nana. As a side note, Britney is hot. She definitely kinda has that “I’m a hot version of Tori Spelling with less buggy eyes” kind of look. Is that just me? Anybody? Anybody? Who Stole My Nana’s Crap!? !